Nicolas Winding Refn’s horror film, The Neon Demon, is out on DVD, Blu-ray, Digital HD and VOD on 31 October, bang on time for Halloween. 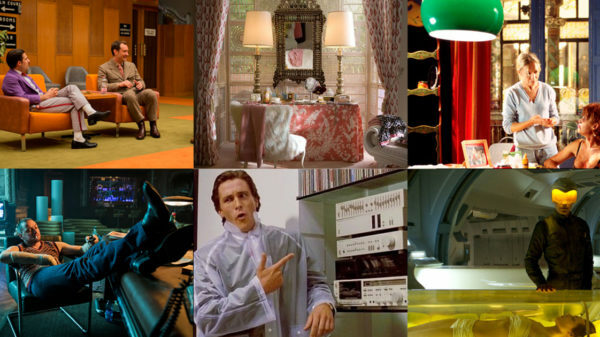 Far from your average horror movie, we take you on a sneak peek tour of some of our favourite film sets and furniture in the movie – PLUS enter our competition to win one of three Blu-ray’s of the movie (info’ below). When 16 year old aspiring model Jesse (Elle Fanning) moves to Los Angeles, she finds herself in at the deep end working with some of the city’s top designers and photographers. Her youth and vitality are devoured by bitchy, beauty-obsessed models Gigi and Sarah who will use any means necessary to get what she has. Make up artist Ruby (Jena Malone) takes Jesse under her wing but Jesse’s innocence and youth make her a target of her fellow models who take revenge on her for stealing their limelight. It’s a Marmite film in the sense that you will literally love it or hate it. We were equally enticed and repelled. Lesbian necrophilia and canabillism aside (really! ), it’s an incredibly visual film and even if it does occasionally slip into pure indulgence, it’s when an artist or film-maker is allowed to indulge themselves that creative boundaries are often pushed. At moments we were bored to tears and then in others – drawn in and hooked again. 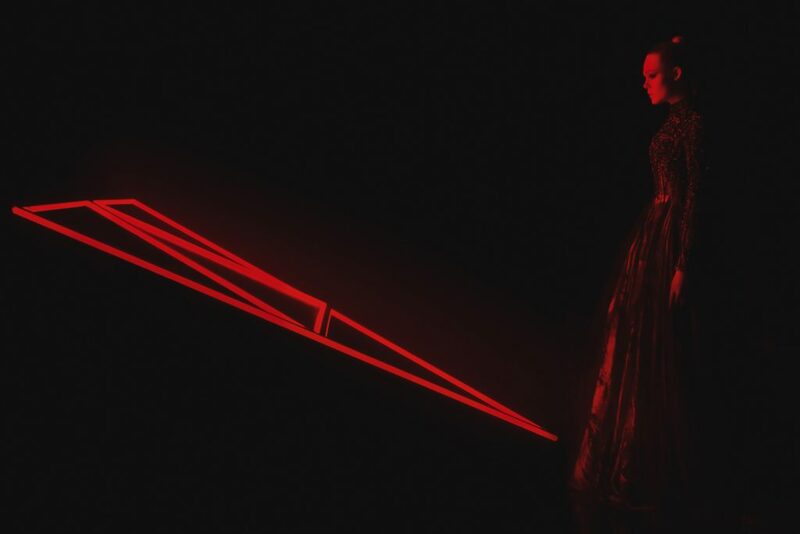 It’s like a high-end glossy fashion photo shoot which blends dazzling cinematography (Natasha Braier) and a plusing synth score (Cliff Martinez) with clever production design by Elliott Hostetter. This is the kind of film that etches on the memory and for that reason we recommend you see it. 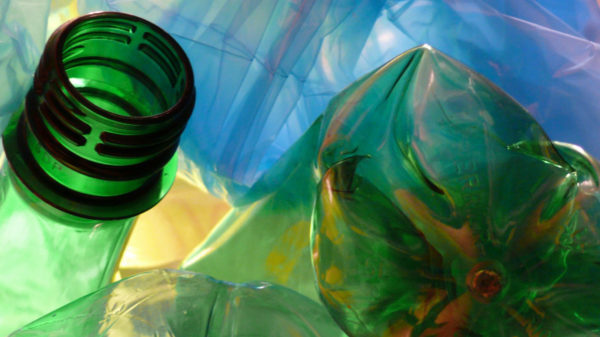 Many of the scenes are (unsurprisingly) bathed in neon and layered with colour symbolism. These rich and dynamic scenes are interspersed with lighter muted tones to create pace and contrast. 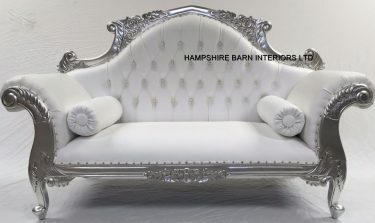 In the opening scene we find Jesse in one of her first photoshoots lying on an ornate, french style, silver chaise/sofa alongside tall free-standing white neon lights against a backdrop of metallic floral wallpaper and mirrored flooring. 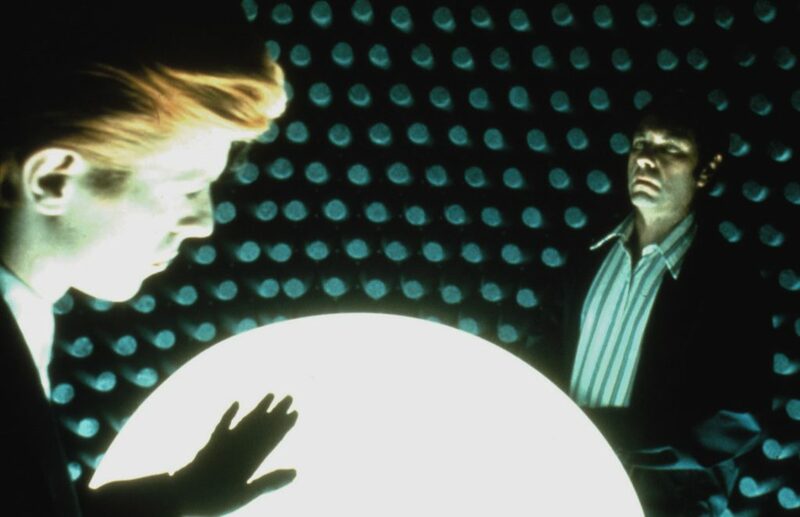 In Jesse’s dressing room we find a typical Hollywood mirror and a backdrop of lights reminiscent of the Bowie scene The Man Who Fell to Earth (1976). This glossy fashion shoot contrasts with Jesse’s Pasadena motel bedroom with it’s clash of wallpaper and curtains in mismatched retro florals. The trippy catwalk scene provides a series of neon abstracts influenced by lighting artist James Turrell and the music here serves brilliantly to heighten the action. The house where Jesse visits Ruby features an innocent blush pink bed and pistachio walls. 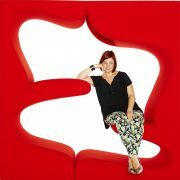 We realise Jesse’s personality is morphing as she has a narcissistic moment on the deep crimson antique sofa. 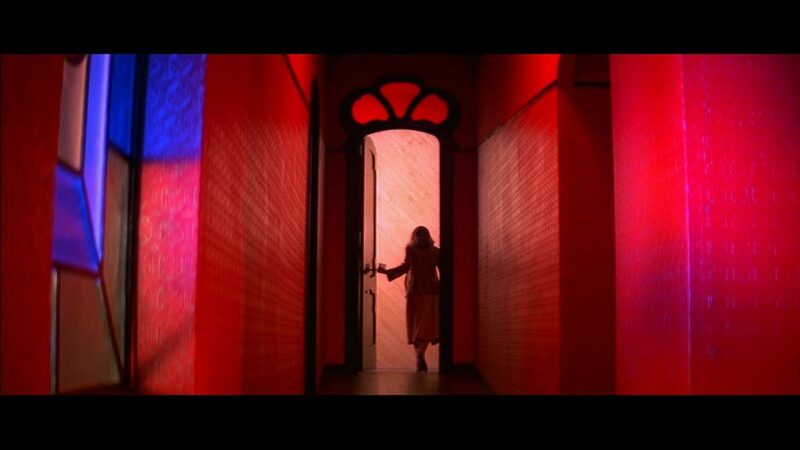 Italian horror movie Suspiria (1977) must have some influence here. 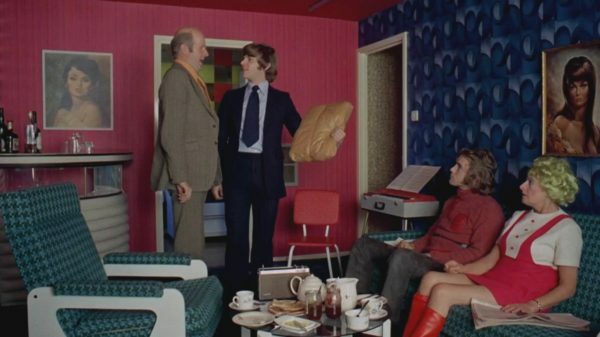 The blue and white geometric wallpaper becomes a backdrop for the most memorable, surrealist moments in the movie. You’ll have to see it to know why. 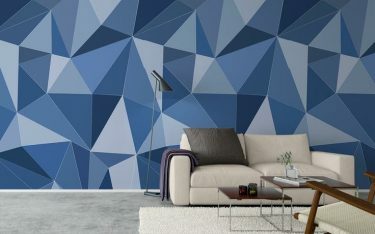 If blue geometric’s on the wall is what you’re after – then the Facet range of wallpaper by Cole & Son is nectar for walls, available from Wallpaper Direct. Our friends at ICON very kindly gave us several Blu-Ray’s to feast on The Neon Demon set design at your leisure. UPDATE 7.11.16: THIS COMPETITION IS NOW CLOSED and the winners of all 3 competitions on the website, Twitter and our Facebook page have been notified. Congratulations to all. The Neon Demon is available to buy now Blu-Ray and DVD, or watch now on iTunes.